Potential pet owners looking for an Easter bunny at local pet stores will have to look elsewhere this year. Sunday marks the first Easter where city council’s ban on the retail sale of rabbits is in effect, meaning one of the only local places to adopt a bunny is the Richmond Animal Shelter. Shelter staff have noticed a decrease in rabbit traffic since the bylaw took effect April 8, 2010, but the fast-breeding animals still abound in the wild on Lulu Island—believed to be mostly abandoned pets or their offspring. The Richmond Auto Mall is a popular haunt for the animals, as is South Richmond. The shelter is sending up to 10 of its rabbits to a sanctuary in Washington State to join bunnies captured from the University of Victoria campus, but that still leaves the shelter with “quite a few” rabbits, said Frederick. According to the Rabbit Advocacy Group of B.C., most rabbits bought for children as Easter bunnies this time of year end up unwanted, neglected or abandoned once the novelty has worn off. “People are unprepared for the care and commitment involved when acquiring a rabbit, and mistakenly believe that bunnies are appropriate gifts for young children,” said spokesperson Carmina Gooch. “Rabbits are not toys nor are they low maintenance starter pets. They are sensitive, intelligent creatures and prefer not to be picked up.” Gooch said rabbits can live at least 10 years, and are “real responsibilities” for an owner, just like cats and dogs. A few other municipalities have also passed bylaws banning the sale of rabbits in pet stores, or mandating the animals be sterilized if being offered for sale or adoption. Nevertheless, bunnies aren’t hard to find in Metro Vancouver pet stores. Last fall, the Union of B.C. Municipalities voted down a City of Richmond resolution to institute a sweeping ban on the sales of bunnies in B.C. Rabbits are available for adoption at the Richmond Animal Shelter, 12071 No. 5 Rd. Potential owners must go through a screening process and pay an adoption fee of $58. Comment: Make this a Happy Easter for rabbits by not making an impulse buy you’ll later regret. Remember, live rabbits are not toys for children – there are plenty of other suitable gifts like a book or a plush toy. Be an advocate for rabbits and help stop the exploitation of these vulnerable little critters as ‘starter pets.’ They, and all creatures, deserve to be treated with kindness and respect. 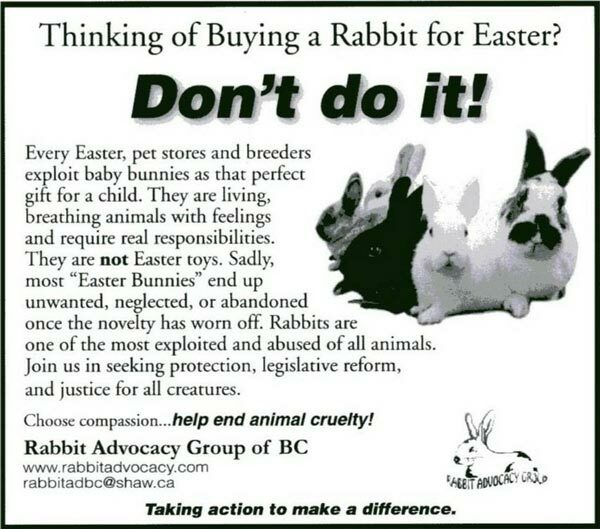 Our Easter PSA for 2011 can be seen in the Vancouver Sun on April 18th and in The Province on April 19th. The Rabbit Advocacy Group has presented to various councils on this very matter many times over the years. There is a high cost to society, both morally and financially, when companion animals are abandoned to the outdoors or elsewhere. Rabbit breeders lobbied municipalities to prevent changes to bylaws that would stop rabbit sales in retail outlets. Unfortunately, this small minority had some success in BC areas until politicians woke up to the realities of impulse buys and the dumping that followed. Regulations aren’t uniform across BC and until there is a massive shift in consciousness nothing will really change. Visit our News/PSAs page for more.